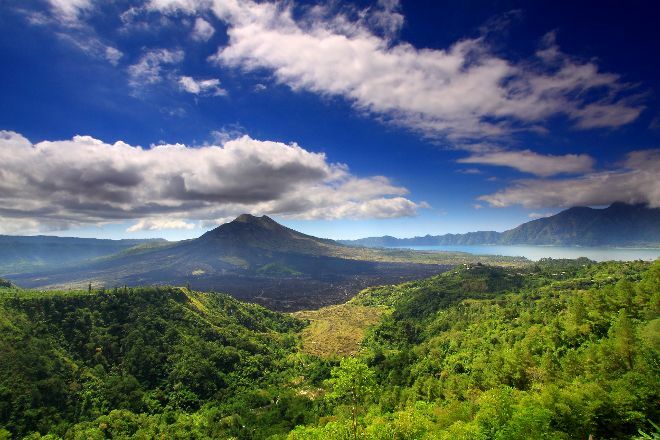 Trek up Mt Batur, an active volcano situated among impressive natural scenery. Head to its crater on a guided tour, or travel independently--the walk up isn't particularly difficult, even to fairly inexperienced hikers. Set within the much larger crater of a volcano that erupted thousands of years ago, the site offers views from the top that include a crescent-shaped lake and volcanic scenery hemmed in by high crater walls. Arrange to visit Mt Batur and other attractions in Kintamani using our Kintamani trip builder app . The trek begins with a guide around 3am if u are looking for a sunrise. Carry minimum stuff with you so as not to get heavy. Comfortable shoes and clothes for hike. Some stretches are quiet steep, rocky and muddy. For breakfast you don't have too many options up there. Just a few bread slices and boiled eggs and bananas. Our guide was very good and helpful. He showed us areas which other guides were not showing to their customers. Tipping your guide in the end would be a kind gesture as they are quiet poor. The atmosphere and experience is quiet breathtaking and gives once in a lifetime feeling. Entire trek is fillled with tourists. If you feel you are fit to climb till the top definitely go for it. Not so hard trek, everybody can make it.! About 2 hours to the top from start point. Bring jackets. Warung is available at the top so you can buy drinks and snacks over there. Better go earlier to find good spot for the sunrise because there will be >300 people on the top for sunrise. Amazing experience. The view from the top is stunning. Not so hard trekking route, options to buy drinks and snacks on the top too from the local vendors. Impressive volcano. The trekking started around 4am and reached the summit just in time to watch sunrise. Our tour guide was very helpful and nice guy. It was an awesome experience. On the way, you will meet gang of the bikers who keep asking whether you need a ride to top of the mountain. They are kind of annoying. Don't discourage by their words. If you are physically fit, 2-3 hours will be enough to climb up. Every day, we help thousands of travelers plan great vacations. Here are some tips on how to use your Listing Page to attract more travelers to your business - Mt Batur. Promote your permanent link - https://www.inspirock.com/indonesia/kintamani/mt-batur-a125708673 - on your website, your blog, and social media. When a traveler builds a plan from this page, the itinerary automatically includes Mt Batur. This is a great way for travelers looking for a great vacation in your city or country to also experience Mt Batur. Promoting your link also lets your audience know that you are featured on a rapidly growing travel site. In addition, the more this page is used, the more we will promote Mt Batur to other Inspirock users. For best results, use the customized Trip Planning Widget for Mt Batur on your website. It has all the advantages mentioned above, plus users to your site can conveniently access it directly on your site. Visitors to your site will appreciate you offering them help with planning their vacation. Setting this up takes just a few minutes - Click here for instructions.